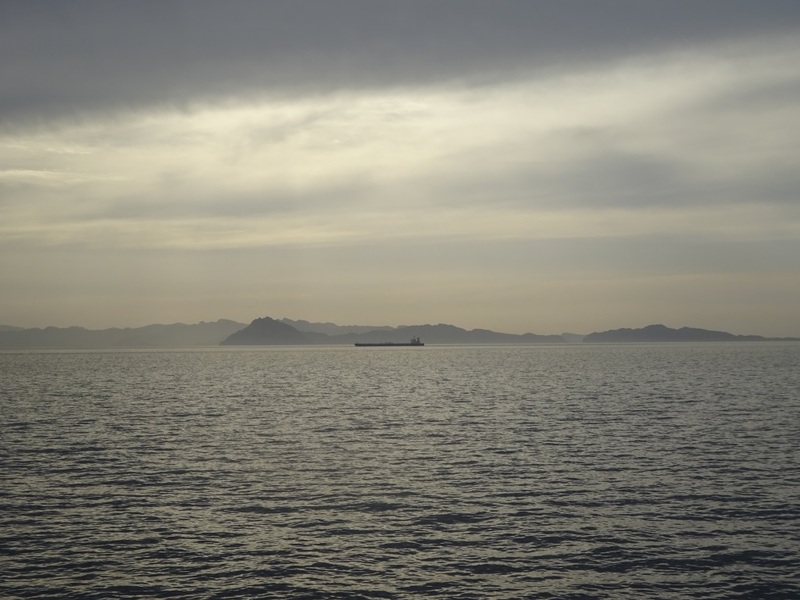 Today we have a sea day and the ship is on its way from Doha to Muscat. 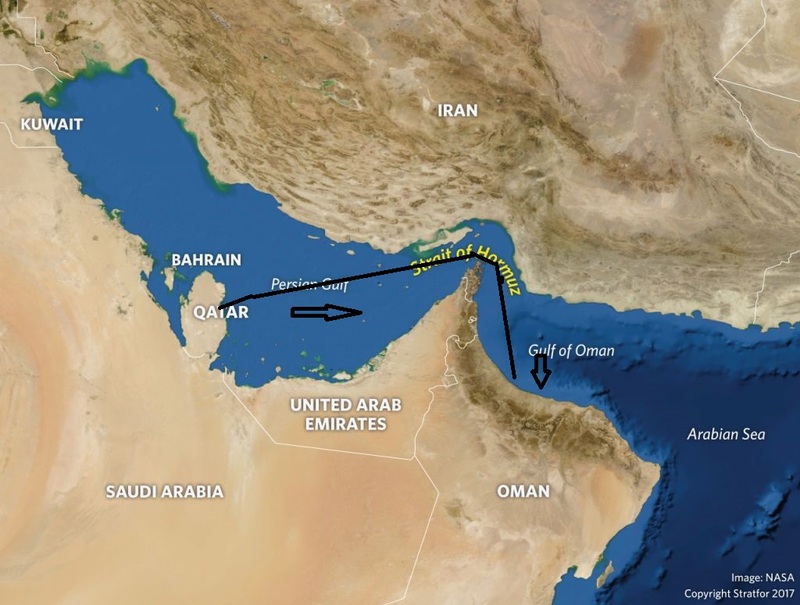 This means we are sailing out of the Persian Gulf into the Strait of Hormuz and then further south. Thus we go North East until we reach the coast of the United Emirates again where we started our cruise and then this afternoon we bend around the top of the area, called Al Khasal also written as Khasab, in the early afternoon and now we are in Gulf of Oman. This is one of the areas where there is a lot of political noise about. On occasion Iran threatens to close the Strait of Hormuz and then the other parties threaten something in return; and vice versa. Our route for today from Qatar to Muscat. Strategically this strait is important as most of the oil traffic comes through here on the way to the rest of the world. And also today we have seen oil platforms everywhere and a considerable number of oil and gas tankers waiting for loading or waiting for the oil price to go up. The latter is something we do not hear very much about but it happens nearly constantly. Not only here but in various parts of the world. Another area where this is not unusual is under the English coast near Torbay. 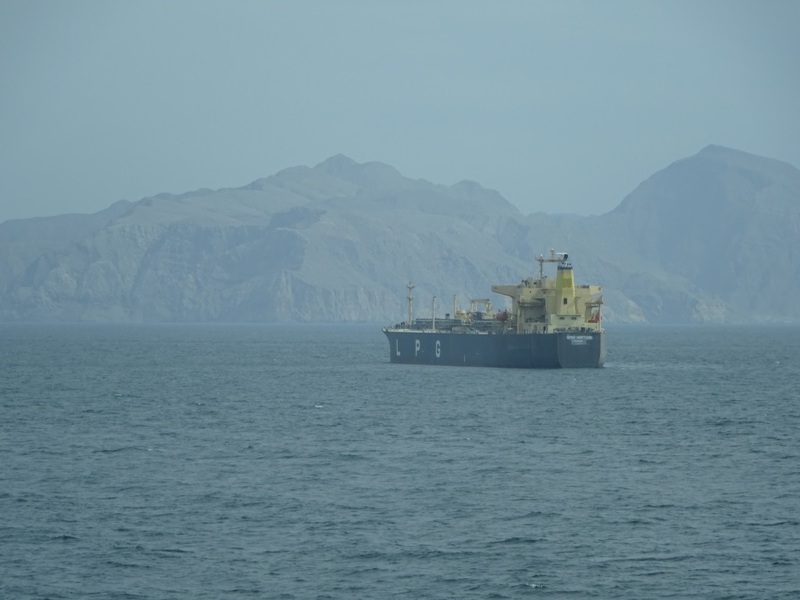 Here is a very sheltered bay and the fully laden tankers just sit there at anchor while the owners wait for the oil price to go up. To operate a tanker costs about $15,000 a day so if he oil goes up $ 1 in price then the profit on a super tanker load can suddenly jump to $ 2 mln as a normal supertanker carries about 2 million barrels of crude oil. So if you have the tanker capacity available for a little gamble in the waiting game, it can pay off big time. And there are a lot of gamblers in the oil business. Governments normally have no problems with this because if the oil price goes up and thus the petrol price at the pump, the tax revenue also increases as it is normally a percentage of the price. This is the cape / pointy end of the coast where we go around the corner at Al Kasab which is the nearest town. This area itself is called Kumzar. As you can see it is very mountainous but also very bare. And of course there is a tanker in the picture as you cannot get away from them. In this case a Gas Tanker. Part of my work is maintaining a port database. This started out of my own needs. When I came to a new port, I shot a number of photos of the dock and everything related so we had something to refer to for the next call. I started doing that the moment digital cameras became available that were of good enough quality. About 5 years ago The HAL Group implemented something similar and now urges all ships to upload photos from every port. Some ships are very good and some ships are not so but more and more material is becoming available. I focus on the ships that do not upload that much, while they do have the photos. But uploading to the company’s database is a tedious and time consuming affair and time on board is precious. Since about 2 years, the ships also use Go-Pro’s to document arrival and departures. Easy enough to do, park the camera in the center of the bridge looking forward and you see the same as the navigation team. If you go to a new port, then running the arrival clip from another ship is really useful as it lays the foundation for good situational awareness. In the same way as it is handy to walk a route first before you have to do it the next day but then within a time frame. I do that most of the time when I go somewhere new. In May I have to go to the US embassy in London for a new travel visa. The embassy has recently moved from downtown London to south of the river to Battersea Park. I have never been there so I will walk the day before the route from the hotel to the embassy to find the right way and clock the time. Old cities are notorious for having closed off roads and having railways in between so it is not as easy as just walking a few blocks around the corner. Then the next day, I can properly set my leaving time from the Hotel and arrive at the appointed time at the embassy Gate. Arriving earlier has no use as they do not let you in until 30 minutes before your scheduled time. This is the coast of Oman with the ever present hue of sand in the sky. And o fcourse another oil tanker in the picture. So Go Pro clips are really useful and in hot demand but also they take a long time to upload. And the same goes for downloading again. So when I go around the ships, I collect every scrap of information that might be useful from the point of a navigator. Then on the next ship I offer to upload and I still have to come a across one navigator who did not start salivating when he/she saw the size of the database. Thus today I spent cleaning up my database so I can merge it with the one of the Seabourn Ovation. This ship has a team which has been very active with making Go Pro Clips. Good for them but also good for the next ship that I will visit. Although if the internet connections are good then everything will have been uploaded already. Tomorrow we are in Muscat, the capital of Oman. The weather will not be much different than the last few days. Partly Cloudy (and that makes everybody happy) and temperatures around 88oF /31oC and a gentle breeze. 11 April 2019; Muscat, Oman. Not sure I want to take the chance and travel that part of the world.